AP hot-shift automatic gearbox : Conventional automatic transmissions suffer two major shortcomings. One is the inevitable energy losses in the torque converter and the other is the complexity of the epicyclic gear arrangements, including clutches and brakes, required if ratio changes are to be made without interrupting the power flow to the road wheels. Moreover, the smaller the engine the greater becomes the significance of the power lost in the torque converter relative to the total power available. Because of the increasing prices of fuels, the trend for the future must be towards smaller engines driving lightweight cars. This stimulated Automotive Products to re-examine the prospects for developing a simpler and more efficient automatic transmission based on the traditional, highly efficient, manual gearbox. A major advantage was that both manual and automatic could, if necessary, be produced on the same production line, or at least a minimum of investment would be required in new manufacturing facilities and equipment for production of the automatic transmission. A prime requirement was the development of a hot-shift system -changing gear without interrupting the power flow to the wheels. Closing the throttle and re-opening it again for each gearshift is not only a tricky operation, but also it can even be dangerous - for example, potentially initiating skids on ice - and can render emission control difficult. Conse­quently, a new system, based on the use of two clutches and transferring the drive from one to the other for each shift, was developed. To understand how it has evolved, look at Fig. 23.19, ignoring the peripheral equipment, including the clutches, and concentrating attention on the mainshaft and the layshaft, top and bottom respectively. The main difference between this and the equivalent manual gearbox is that the gear pairs for 2nd and 3rd speeds have been interchanged - the order, left to right, in the conventional box would be 4, 3, 2, 1. Additionally the mainshaft has been divided, leaving 1st, 3rd and reverse gears driven conventionally through the main clutch A, on the engine flywheel, while 2nd and 4th gears are integral with a sleeve rotating freely on the mainshaft and driven through a second, smaller clutch B, mounted on the rear end of the gearbox. This second clutch is driven by a quill shaft extending from the engine crankshaft right through the gearbox. 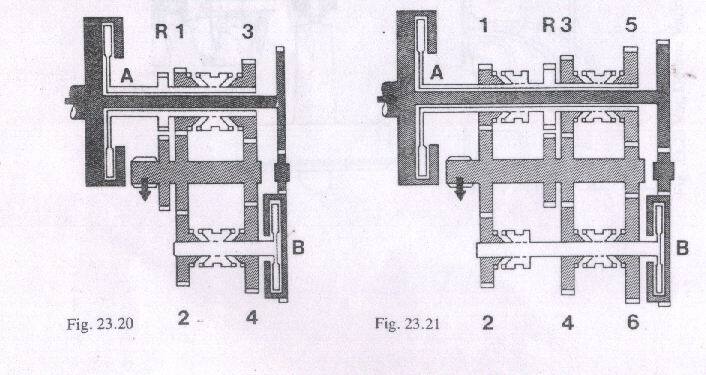 The main clutch is released by the hydraulic actuator, top-right in the illustration, and engaged by its diaphragm spring, in the usual way. Since the secondary clutch is not used for driving away from rest, but only for gear changing, it is not subject to much slipping and therefore can be smaller and is of the wet type. 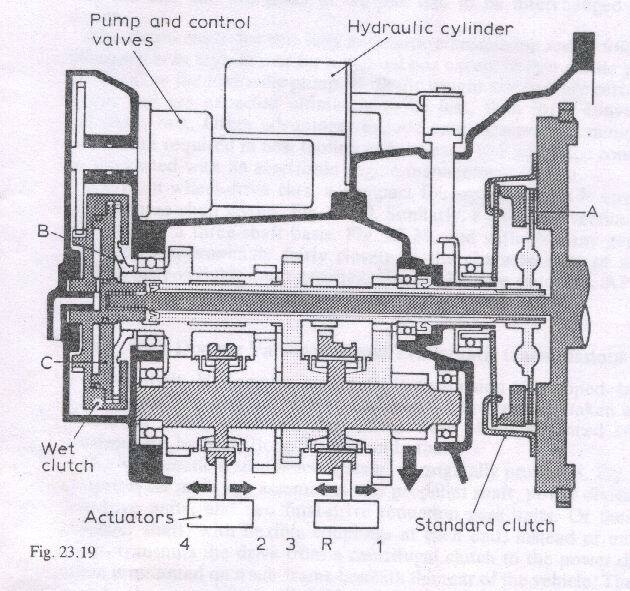 It is engaged by hydraulic pressure acting on the rear face of the pressure plate C. Hydraulic power is provided by the pump, top left, driven by the continuously rotating portion of the second clutch, and the gears are shifted by hydraulic rams, represented by the two rectangles at the bottom of the illustration. Overall control is effected electronically by a computer, which could be designed to perform also the functions of engine control and thus optimise engine and transmission operation. 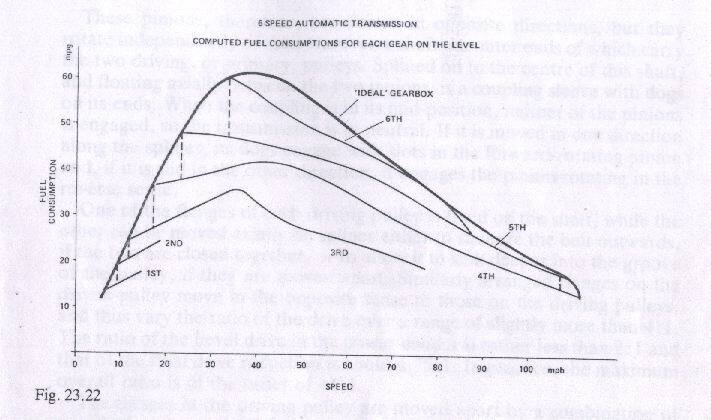 So far as the transmission is concerned, the inputs to this control come from a governor, and sensors for indicating which gear is engaged, throttle-position and engine and gearbox output speeds - the throttle-position sensor of course is, in effect, a torque-demand sensor. The outputs go to control the valves for the hydraulic actuators of the clutches and gear shift rams. All gears are held in engagement by hydraulic pressure and are sprung out into neutral. The sequence of operations is as follows: with the engine idling and gearbox in neutral, selection of drive, using the manual control, first causes disengagement of the primary clutch and then a shift into 1st gear. Depression of the accelerator initiates automatically the gradual engage­ment of the primary clutch, thus setting the vehicle in motion. At an appropriate speed, the governor signals a gear change. Since the secondary clutch is already disengaged, 2nd gear can be selected by its actuator operating through its synchroniser. Then, the rear clutch engages while the front one simultaneously disengages, to perform the hot-shift. Finally, the hydraulic pressure to the 1st gear is released, so it springs out of engagement, and the primary clutch is re-engaged, to keep all parts rotating at engine speed and thus keeping the demands on the synchroniser for the next gear shift to a minimum. Subsequent gear shifts are made similarly, by transferring the drive from one clutch to the other, which is why the 2nd and 3rd gears in the box had to be interchanged for this design. The claims made for this fully automatic transmission are as follows: its efficiency is as high as that for a manual box except in that a little power is absorbed by the hydraulic pump. Both the weight and cost are certainly no more, and are expected ultimately to be less, than for a conventional automatic box. Other advantages include ease of servicing, minimum of investment required in new tooling and the ease with which the control can be integrated with an electronic engine-management system. For front-wheel-drive cars, a compact four-speed design is attainable, using a three-shaft layout, Fig. 23.20. Similarly, a six-speed version can be designed on a three-shaft basis, Fig. 23.21, and with so many gears it is possible to approximate fairly closely to the characteristics of an ideal continuously-variable ratio gearbox. Fig. 23.22. The outcome, AP claim, would be a potential saving of 25% in fuel consumption. The Motor Vehicle. 1986. Author : K. Newton, W Steeds & TK. Garrett. ELBS, The English Language Book Society & Butterworths.